The advantage being that most users will be able to choose one common options without searching through the dropdown, but the outlier user will still be able to find their choice in the dropdown. Nick Babich mentions using autocomplete in a text input field as an alternative. I think I like that approach more. It seems faster for users. And it preserves more screen space. The downside to it is that it may be difficult to achieve from a technical perspective. The pattern that you are looking for is probably similar to a dropdown the is broken down into two different sections, the first of which is a list item of the common options that you represented with the radio button, then the rest is a sorted list of list items. This avoids introducing two different input behaviours for a single input value, and makes future changes much easier to manage. The combination you are proposing is not very common. 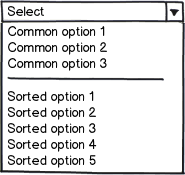 Because a good UX should avoid to surprise the user ("Don't make me think"), I would rather choose the more often seen drop-down with those three most common options on top of the drop-down list. However, the pro of your proposal is that it is more comfortable for the users from those three countries. And the combination is not difficult to understand. The implementation might indeed be a bit more complicated, but probably not so much that it would justify a reduced UX. 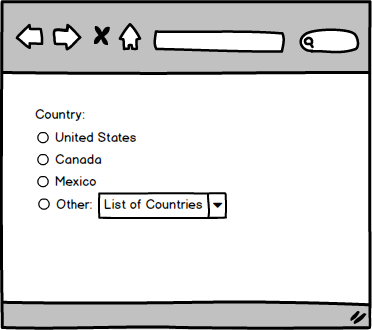 What you have proposed may be not a very often encountered pattern, but I think it is still valid, especially if your Users are mostly from the three most visible countries, and the importance of the other ones is really lower. One thing that I would consider, though, would be hiding the dropdown before User selects "other".